Navy capped off its season wth a ninth win by beating Middle Tennessee in the Armed Forces Bowl. While NFL coaches were being fired Monday morning, there was a college football game. 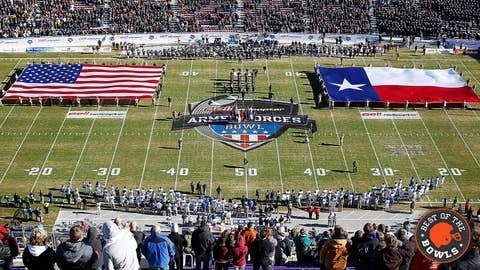 Navy played Middle Tennessee in the Bell Helicopter Armed Forces Bowl, with the Midshipmen winning 24-6. So, sure, it wasn’t the most exciting game or biggest one on the bowl schedule, but it was still significant. It was the final college football game for the Navy seniors, who will now, as required by attending the Naval Academy, devote the next five years to serving the United States. With that in mind, here’s a shout out for all 21 seniors listed on Navy’s official roster. To these 21 and those not listed on the official roster who still have the same service requirements: Congrats on a 9-4 season and thank you. I mean, with that name, what else needs to be said? Ryder was a starting safety for Navy in 2013. Unfortunately, his final college game was cut short, as he was ejected in the first half of the Armed Forces Bowl for targeting, a call that was widely agreed upon as being horrible. Albrey Felder – Orange Park, Fla.
Felder, a cornerback, played on the scout team his first three seasons in Annapolis. On Nov. 16 against South Alabama, he finally got an official taste of Division I football by getting into the scorebook with his first career tackle. If you ever run across Albrey, maybe he can tell you the story in Chinese (his major). Marcus Thomas – Baton Rouge, La. Thomas served the Midshipmen as a running back and kick returner in 2013. He averaged 10.1 yards per carry on 26 attempts and 22.19 yards per kickoff return. He was named the FBS Independent Special Teams Player of the Week in early November after returning five kickoffs for 137 yards against Notre Dame (Navy lost 38-34). In the Armed Forces Bowl, he returned three kicks for 98 yards. Thomas is majoring in American politics and law. DJ Sargenti – Ridgefield, N.J.
Sargenti started at linebacker this year after originally enrolling at Navy as a quarterback. The highlight of DJ’s season was likely Nov. 22 at San Jose State when he recorded 18 tackles (10 solo), and the Midshipmen beat the Spartans 58-52 in triple overtime. And then, Monday, Sargenti capped off his career with an interception against Middle Tennessee. Awesome. Staten saw action this season as a running back, rushing 36 times for 375 yards (10.4 average) and three touchdowns. He also caught five balls for 65 yards and one TD. In the bowl game, Staten had six carries for 37 yards. For more on Darius, here’s a recent story from Andy Friedlander of The Dallas Morning News. Shawn Lynch – Pelham, Ala.
A wide receiver, Lynch had six catches for 79 yards this season, with one of them going for a 29-yard touchdown against Delaware. He’s regarded as the best blocker in Navy’s option offense. Barry Dabney – Nashville, Tenn.
Dabney helped plug the middle of Navy’s defense, as a 6-foot-1, 302-pound nose tackle. He started 10 games in 2012 and will leave Annapolis with a degree in general science. Bolena, a wide receiver, had 13 grabs for 164 yards this season. You can hit him up on Twitter at @CMoneyB_88. Michael Tuimavave – Daly City, Calif.
Tuimavave played linebacker for Navy and recorded a tackle against South Alabama. Palelei has seen a lot of action at defensive end in the last two seasons, recording 21 tackles and a sack in 2013. His father, Lonnie, played football at UNLV and donned jerseys for the Pittsburgh Steelers, Philadelphia Eagles, New York Giants and New York Jets in a six-year NFL career. Evan is majoring in history. Michael Huf – Drexel Hill, Pa.
Huf is a reserve defensive end for Navy who didn’t see any game action in his first three seasons at Navy and has worked this season on the scout team. He passed up scholarship offers from Syracuse and Akron to come to Annapolis. “Everyone comes in with big hopes and dreams,” Huf said earlier this season. “As things start to develop, some people fit into certain spots and others don’t. Thomas Stone – Melbourne, Fla.
Stone has served Navy’s offensive line for the last two seasons and was also an option at center. In addition to football, his bio says he enjoys musical theatre and is involved with the Naval Academy Catholic Choir. Hey, maybe it’s still worth a shot. Matthew Van Halanger – Athens, Ga.
Van Halanger has seen limited action at Navy on the offensive line and will leave Navy with a degree in oceanography. His dad, Dave, was a two-time All-East pick as an offensive lineman under Bobby Bowden at West Virginia in the ‘70s. Cody Peterson – Olympia, Wash.
A starter at inside linebacker and a 2013 co-captain, Peterson has been a big part of Navy’s defense this season. He recorded double-digit tackles in nine of 12 games with a season-high of 18 against San Jose State. Travis Bridges – Hollywood, Fla. When the 318-pound Bridges isn’t throwing his weight around as a nose guard, he enjoys playing the saxophone. Family note: His first cousin is NFL running back Tim Hightower. Justin Haan – Byron Center, Mich.
Haan is a long snapper and an emergency punter. This is his fifth season associated with Navy football, as he missed the 2011 season while doing missionary work in Africa. He is an international relations major with a 3.75 GPA. We’ll see you in the White House, Justin. Womack has contributed on the scout team as an offensive tackle and came to Annapolis with current teammate Evan Palelei from Bishop Gorman High School. Son of Paul and Kathleen, he’s majoring in history. Eric Mahler – Matawan, N.J.
Tell him congrats for his four years as an offensive guard and thanks for serving. Brantley Horton – Cleveland, N.C.
Horton has been a scout team receiver for Navy and got into a game last season against East Carolina. He’ll get a degree in economics from the Academy. Matt Aiken – Roanoke, Va.
Aiken is a starting wide receiver and a co-captain of the 2013 squad. He’s caught eight passes for 150 yards and two touchdowns this season. His brother, Danny, played football at Virginia and is currently a long snapper for the New England Patriots. Hayden Maples – Raleigh, N.C.
Maples has helped the Midshipmen as a scout team receiver and majored in American politics and law while at Navy. Congrats to all the Navy seniors, those listed here and those not on the official roster, and best of luck in the future. Teddy Mitrosilis writes and edits college football for FOXSports.com. Follow him on Twitter and email him at tmitrosilis@gmail.com.